Do you run an information center, a museum or work in an office lobby or waiting room? You probably need a professional display rack for holding your brochures and literature. The Safco 5601CL Reveal 24 pamphlet wall-mounted display may be just what you need. 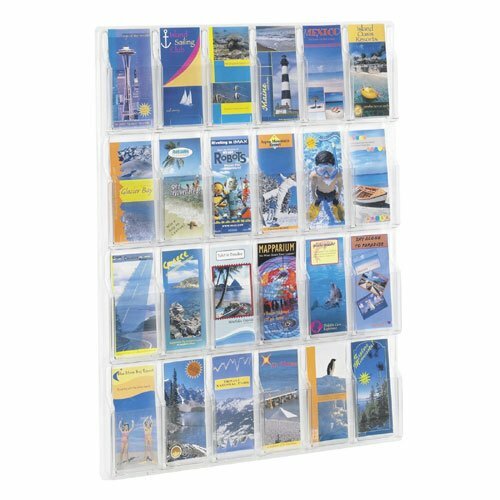 This wall-mounted brochure rack is one of the best out there and with 24 pockets (each 1 ¾" deep), it can hold a lot of stuff. Wall-mounted brochure racks are especially nice because the keep brochures accessible while using up often-wasted wall space. The Safco 5601CL Reveal is made from thermoformed one-piece units that have no sharp edges or corners. The Safco 5601CL is Greenguard Certified. Order yours today! Thermoformed, one-piece units have no sharp edges or corners. Each pocket holds 1-3/4" of printed material. Weight is based on dimensional weight.